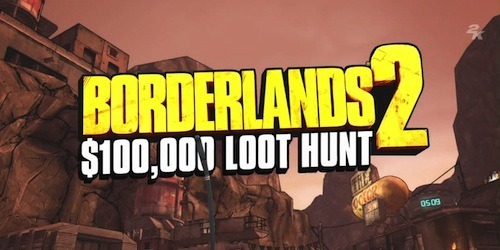 Starting October 11th, game publishers 2K and Gearbox Software will launch their Borderlands 2 - $100,000 loot hunt. Participating players will not only get the chance to earn some awesome in-game loot, but may also be lucky enough to win valuable prizes in real life. Everyday new targets and challenges will be assigned to those that have signed up. If completed, players will be rewarded with some of the games best and rarest loot. The competition will kick off with a target of the fearsome Bullymong known as Knuckle Dragger. If the player can eliminate this foe, they will earn themselves the Gwens Head pistol. From that day onwards, the players will have many more chances to win loot, along with suspected "uniquely super-awesome guns" that may be added to the game. The competition starts on October 11th at 10:00a.m. ET, when the game becomes slightly altered so that several the ‘unique’ guns start dropping in random locations dotted around the map. For the following 28 days, different challenges will be added until the contests end on November 7th at 05:00a.m. ET. 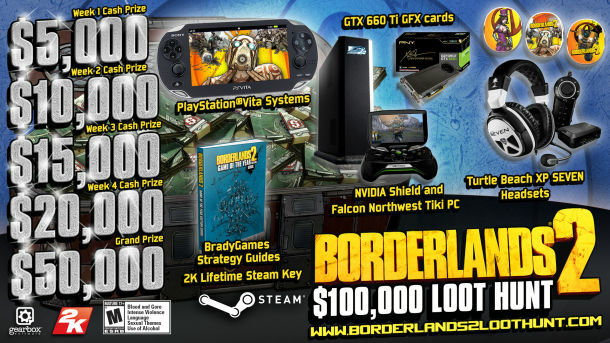 -A NVIDIA Shield or PlayStation Vita handheld gameconsole. -A life times free subscription to all games made by 2K that are released on Steam. Sadly, this loot will only be available to residents of the US but all in-game content will be available wherever you are. Good luck and happy loot hunting!